What salient points emerge when decoding online news? News organizations rely on elements of form, structure, and content in the design of their websites as tools to convey their brand and underlying agendas. The result of which has the potential to change how we perceive both the news reported, and the organizations as a whole. In the context of journalism, many news outlets carefully craft these design elements and systems to convey the sense of trustworthiness and objectivity that their reporting strives to achieve. Through analysis of the news websites of the British Broadcasting Corporation (BBC), National Public Radio (NPR) and the Wall Street Journal (WSJ) we looked to uncover how each organization used design to communicate a neutral and centered perspective to a broad audience of readers. The BBC, NPR and the WSJ each have lasting legacies rooted in different media channels. The BBC being primarily a broadcasting organization, NPR a well respected radio network, and the WSJ a long-running print newspaper. Due to their neutral and unbiased positions coupled with their legacy, readers perceive them to be trustworthy news sources. 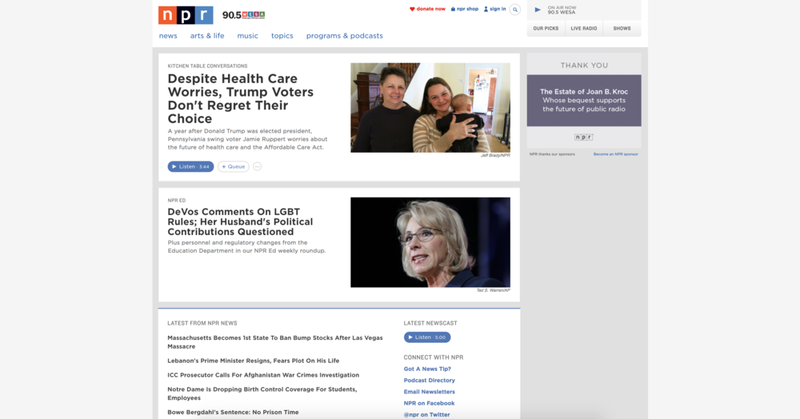 Although the BBC, NPR, and the WSJ each take different approaches towards communicating this neutrality, they have successfully maintained the vital characteristics that define their respective brands. What is important to keep in mind when reading online news? When reading news online, it is important to take into consideration how elements of form, structure, and content are being used to communicate underlying agendas of the source. 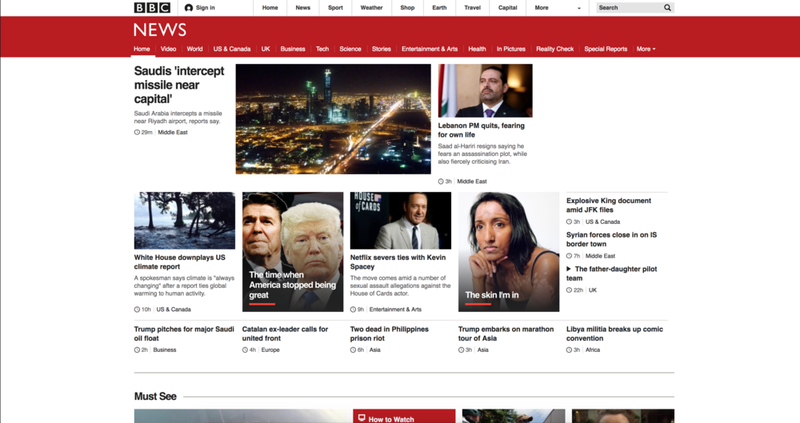 When looking at the news websites of the British Broadcasting Corporation (BBC), National Public Radio (NPR) and the Wall Street Journal (WSJ) in particular, vastly different approaches towards communication design emerged in pursuit of conveying a more centered, neutral, point of view. It is important to note however that despite this, the BBC’s matter of fact stance, NPR’s calm and soft style, and the WSJ’s professional and journalistic approach at a fundamental level all work in achieving this goal. We believe that it is this combination of neutrality and a long legacy of reporting the news that leads to the perception of trustworthiness and ultimately allows all three outlets to appeal to a broad audience. Telescope is a tool that seeks to make people aware of their news reading habits and nudge them towards being better-informed readers. In an effort to push people out of their filter bubble Telescope generates a customized visualization, or constellation, which allows users to see patterns in their news reading habits. Users can look at the larger landscape of news viewership from their community and the internet as a whole so that they can take a step back to reflect on their news consumption habits. In parallel, Telescope will use a temporary Google Doodle campaign consisting of an abstracted version of a given user’s constellations, to lead users to the microsite. Once inside, they can browse through a comprehensive visual history of their news reading habits organized by sources and color-coded by topic. This information is overlayed upon a grid of stars, comprised of frequently visited news venues arranged along a political spectrum defined by Pew Research audience data. As the user reads more about any given topic the size of the stars “glow” grows accordingly. Telescope provides a time slider, so users can begin to further understand how their reading behaviors have evolved over time. Additionally, Telescope gives users an in-depth overview of their reading habits presented in real time, juxtaposed with those of other users throughout the world. By allowing users to overlay constellations from those within their social circle and community, users can begin to take stock of their reading behavior compared to those around them and be incentivized to explore other sources and issues. Furthermore, users can share their constellation on social media to get others engaged while further promoting conversation about their collective news reading patterns. This process of comparison looks to encourage users to continually engage with the tool and ultimately explore a broader range of news venues and topics. By doing so, Telescope confronts readers with a reflection of their own habits while serving as a reminder to critically consider varying perspective of the world around them.